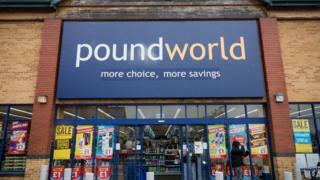 Discount retailer Poundworld has been put up for sale by its owner, private equity firm TPG, the BBC understands. The chain had been looking at closing about 100 of its 355 stores as part of a restructuring plan, as it battled a tough retail environment. That process has now been put on hold by US owner TPG after it received expressions of interest in the company. Poundworld, which employs about 5,500 people, is among many stores on the High Street which have been struggling. Like many retailers, it has been hit by falling consumer confidence, rising overheads, the weaker pound and the growth of online shopping. The chain imports a lot of its stock and is having to pay more for it because of the fall in the value of the pound. The process of finding a buyer will happen over a short timeframe, the BBC understands, to allow any new buyer to continue the restructuring process if required. It had been expected to announce the terms of that process - known as a Company Voluntary Arrangement (CVA) - this month. CVA's have become popular among retailers because they allow firms to offload underperforming stores and reduce rents while avoiding administration. Poundworld, which has its headquarters in West Yorkshire, was formed in 2004, but it says it can trace its origins "back to 1974 and a market stall in Wakefield, West Yorkshire". Private equity firm TPG Capital, which bought a majority stake in Poundworld in 2015, also controls the restaurant chain Prezzo whose landlords agreed to a CVA last month. Prezzo is closing 94 branches. A number of other retailers have chosen to go through a CVA, including New Look and Carpetright, while House of Fraser is expected to make a formal CVA proposal next month, with a full restructuring in place by early 2019. Earlier this year, both Toys R Us UK and electronics chain Maplin went into administration.